Was SHERLOCK's 'The Abominable Bride' a marriage made in heaven? We'd been led to believe this special would be "special" in the sense it was going to put Sherlock (Benedict Cumberbatch) and Watson (Martin Freeman) in the Victorian era, which means we'd be getting a period faithful story. It sounded a bit odd that the modern-day Sherlock would completely undo its own concept, just for the opportunity to see Cumberbatch in a deerstalker and Freeman with a bushy 'tache. But it made enough sense, given how the Victorian era has a very popular Christmas flavour to it, thanks to the likes of Charles Dickens' "A Christmas Carol". I was ready for a flight of fancy, completely removed from the concerns of the show's own modern history. "The Abominable Bride" wasn't really taking place in the 19th-century, it was just a drug-induced fantasy in Sherlock's head—a quite literal trip around his so-called 'mind palace'. Cerebral cosplay, one might say. Weirdly, this entire feature-length special was being imagined during the five minutes it took Sherlock's jet to return to earth. I know some people have taken exception to this fact, but I don't see why. A special we've been waiting for since 2014, two years ago, didn't really progress the story. Well, true. But I didn't really care. It primarily existed because it was good fun seeing Sherlock and Watson romping around Victorian London in horse-drawn carriages, tackling a spooky mystery about a vengeful bride who's seemingly returned from beyond the grave. A Christmas horror story—how perfect for the season. The flaws of "The Abominable Bride" weren't specific to this particular story, either. Sherlock has been getting increasingly too clever-for-its-own-good since Series 3. There's a pervasive feeling that writers Steven Moffat and Mark Gatiss aren't very interested in crafting good mysteries for the great detective to solve, they just enjoy stacking puzzles on top of each other. Most episodes almost feel like individual sketches, strung around a central idea. Some of those sketches are very funny, clever, witty and entertaining. Some of those sketches aren't. Some of them have Mark Gatiss in a fat suit, or a laboured 'sign language' joke. Beyond the whimsy of this special, there was a feeling it wanted to be big crowdpleaser—which is sort of has to be, considering we wait so long between instalments, and this episode was being shown in cinemas. It's another reason for the period setting, which just lends a cinematic feel to everything, but we also saw the return of Moriarty (Andrew Scott)—a supervillain Moffat kept saying would be used sparingly, but has appeared in every single series. He died in 2012's "The Reichenbach Fall", but has appeared in two episodes since! This story, via the unravelling of how the bride faked her own death, simultaneously wanted to reveal how Moriarty might have done the same thing. But unless I'm misunderstanding something, the bride only faked her death temporarily, and most of her posthumous appearances were wronged female doubles seeking vengeance against men in her name. 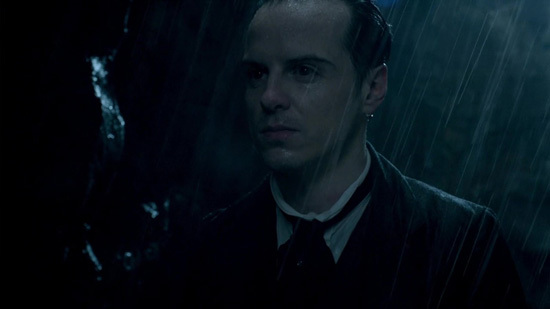 So, the same is true of Moriarty? Series 4 will presumably find Sherlock up against a gang of Moriarty acolytes, using him as a figurehead. Right? That sort of makes sense, but I somehow doubt they're going to ditch Andrew Scott. He'll probably appear as some kind of presence—either through flashback, dream, or hallucination. I mean, if he genuinely cheated death... then this episode didn't reveal how that was done. 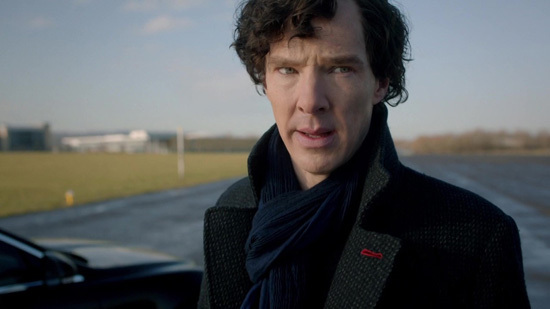 Mind you, the show never really answered how Sherlock didn't become pavement pizza after leaping off a hospital roof. It's this kind of stuff that's beginning to bug me. I love Cumberbatch and Freeman in these roles. I love how stylish the directing and its visuals can be—although the show misses Paul McGuigan, and attempts to emulate his playfulness can be hit-and-miss. I really like the quirkiness and meta-fun the writers have with the show. I just don't like how Sherlock keeps moving away from doing the basics of a detective show: tell me a good story, with a mystery that makes sense, that I can follow without too much plot acrobatics getting in the way, and that actually seems to care about the supporting players.